Family Leguminosae Endl., Genus Vicia L.
Vicia sativa L. subsp. sativa. It is a pubescent annual with scrambling and climbing growth habit. Stems arising from the base are hollow, square in cross-section and up to 2 m tall. It has a slender taproot system with numerous lateral branches. Leaves compound pinnate with 3-8 pairs of opposite leaflets and 2-3 terminal tendrils. Leaflets narrowly oblong, square at the apex and with a small projecting mid rib. Stipules are small and divided. Inflorescences borne singly or in pairs on short peduncles arising at the base of the leaves, mainly blue to purple but sometimes white and self-fertilized. Seed pods contain 4-12 round but flattened seeds, mainly black to grayish in color. It is a self-compatible plant, cross-pollinated mainly by bees. Blossoms in June-July, seeds ripen in July-August. 2n = 12. It is distributed throughout the European part of the former USSR, Caucasus, Western Siberia, mountains of Central Asia, Kamchatka peninsula. Plant occurs in fields, bushes, roadsides, riversides, populated places. It is adapted to a range of soils but not acidic, poorly-drained soils. It has a rapid growth rate. Sprawling growth form but grows upright when sown with a companion cereal, e.g. commonly with oats and to a much lesser extent with barley or wheat. It is a short-term catch crop. It has a high nutritive value. Protein-rich, highly acceptable feed for different classes of stock. 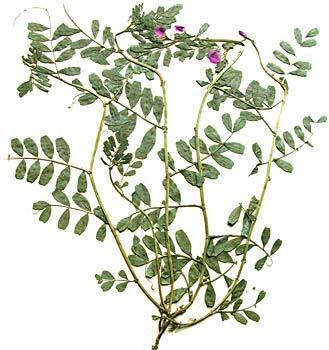 It is a valuable constituent of vetch/cereal mixtures. It prefers well-drained, moderately fertile soils pH 6.0-7.0. The plant responds to P fertilization. It is less tolerant of poorly-drained soils than hairy vetch. It is utilized for hay or silage, particularly arable silage, from cereal/vetch or cereal/pea/vetch mixtures. It can be grazed by a range of livestock, including zero grazing (green fodder cut and carried). Lax grazing is necessary in order to leave the basal axillary buds which are the re-growth sites. It is highly acceptable as grazed or conserved forage. © Dzyubenko N. I., Dzyubenko E. A.